Nine high school students from around the world are followed on their journey to compete at ISEF, the International Science and Engineering Fair. They are among 1,700 of the smartest, quirkiest finalists from 78 countries, regions and territories around the world who will face off to compete for the best overall project, which comes with a prize of $75,000. We get caught up in their lives (they're not the most popular kids in school, but they are the brightest), their goals (Anjali is working to prevent cancer, while a Brazilian teen has come up with an innovative solution for treating the Zika virus) and their triumphs. Teenager Jack Andraka loses his mind when he's announced as the winner of the top award – the prestigious Gordon E. Moore Award for his work to detect the early stages of pancreatic cancer. 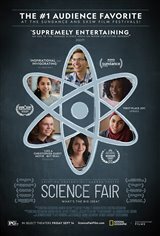 As Variety puts it, Science Fair is "an ode to the teenage science geeks on whom our future depends."